Kirk Cousins has not been a good quarterback this season. So why is it that fans, the media and, most importantly, Jay Gruden himself, seem to have more patience with Cousins than they did with Robert Griffin III when he struggled and was benched last year? The answer is not a simple one and requires some unpacking. 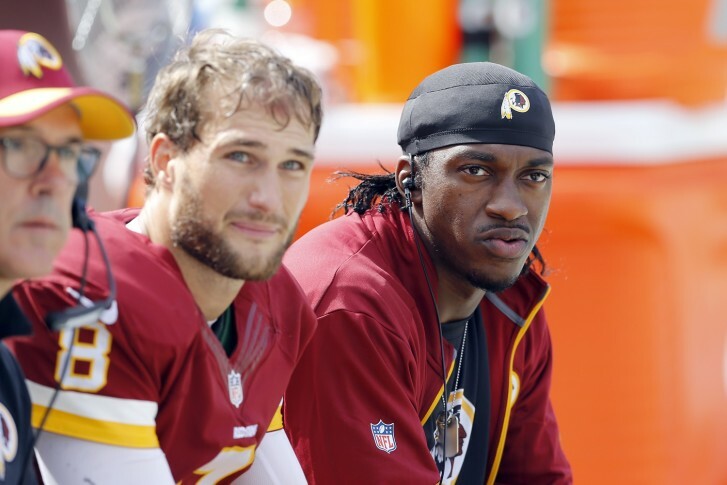 WASHINGTON — Kirk Cousins has not been a good quarterback this season. So why is it that fans, the media, and most importantly, Jay Gruden himself, seem to have more patience with Cousins than they did with Robert Griffin III when he struggled and was benched last year? The answer is not a simple one, and requires some unpacking. The uproar over the difference in the way Cousins and Griffin have been treated was initially raised by ESPN’s Bomani Jones informally on Twitter, then more concretely through a conversation with The Washington Post’s Dan Steinberg. That conversation has been dissected by many over the past few days, but the distraction over Jones’ comments, particularly those parts that apply to how race may have factored into the situation, have clouded some of the underlying facts. There were many issues with Fox Sports’ Jason Whitlock’s response to Jones, but he was correct in his point that the expectations for Griffin and Cousins have been different from the start. After the franchise leveraged its future to get Griffin, he carried immense pressure to perform at a high level, which he somehow exceeded in his transcendent rookie season. That performance, fairly or not, only cemented those astronomical expectations. Cousins, on the other hand, was a fourth-round pick in the same draft, passed over by every other NFL franchise at least three times, and has played at a backup-caliber level his entire career. With a team that went 3-13 last year (including with Cousins himself going just 1-4 as a starter), the expectations were considerably lower. Based on all available evidence, this is not correct. Despite helping fortify the foundation of the team through additions on the offensive and defensive lines, and despite an increased emphasis on the running game that shortens the game and takes pressure off the quarterback, Cousins is almost as identically mediocre as he has always been, which means he’s been demonstrably worse than Griffin. The passing attack ranks 23rd in the league in yards per game and is just one of two units with more interceptions (8) than touchdowns (6). That has led to the second-lowest quarterback rating of any team in the league, a paltry 77.0, lower than even Griffin’s worst season (82.2 in 2013). But we shouldn’t be surprised. This is exactly what Jay Gruden signed us up for, exactly what he wanted. After all, Cousins’ career rating was, wait for it, just 77.5 coming into this season. That’s where we can start to shed light on the roots of this controversy — Gruden’s patience with Cousins over Griffin. Compare those to this year, when Cousins has struggled. The quote below came from Gruden after last week’s loss to the Jets, during which Cousins completed 58 percent of his passes for 196 yards, one touchdown and two interceptions. Those are two very different reactions to two very similar performances. Granted, this year’s Jets look like a better team than last year’s Bucs, but the contrast in the head coach’s reaction is stark. That Gruden has wanted Cousins as his starter since he arrived is not a secret. But it’s important to remember who Gruden is to understand how he would arrive at that decision. RG3 was never going to survive in Gruden’s system. It was created for a different type of player, the “traditional pocket passer,” and Gruden clearly demonstrated that he cared more about his system than his star quarterback. That he insisted on plugging Cousins into that system had more to do with the type of player Cousins is than how good he is. There’s a fair argument that Gruden’s system has roots in his own knowledge of the game as a pocket-passing quarterback, ranking in the top five all-time in passing yards, completions and touchdowns as a college quarterback at Louisville. As the Cincinnati Bengals’ offensive coordinator from 2011-13, he coached a pocket-passing quarterback in Andy Dalton, who has still never run for as many yards in a season as RG3 did in the first three games of his NFL career. Whether Gruden’s change in rhetoric can be chalked up to a general realization that he needed to be more supportive of his signal-caller or a personal preference between the two is something only Gruden knows. But the way a coach defends (or doesn’t defend) his players publicly impacts the degree to which the media and the fans see them as well. Jones’ criticism that we all accept the fact that Cousins would be successful in a prostyle, pocket passer system while believing Griffin would have to learn and adjust, speaks to a larger discussion about race and sports that is well worth having. But, the particulars of Gruden’s football background and how they pertain to this decision-making muddy those waters for this situation. There is also, critically, the potential albatross of Griffin’s contract clause, the $16 million option that will kick in automatically if Griffin is injured on the field. That would deal a crippling blow to next year’s payroll options. Given Griffin’s prior injury history, there is an entirely reasonable strategy in not playing Griffin at all, especially considering what anyone who watches this team from any objective standpoint has understood about this season before it ever began: even a healthy RG3 would not make enough of a difference to get them to the playoffs. From a pure football operations standpoint, the only logical choice is to keep Griffin on the bench. While Colt McCoy remains an option, there is no reason to believe he’d be a major upgrade, given his 1-3 record as a starter in Washington and the fact that his profile as a player is closer to Griffin than to Cousins. It’s not simple to break down the difference in rhetoric around Griffin and Cousins; not when the gulf in our expectations of their talent levels is so vast; not when a coach is trying desperately to save his career by validating his system; and not when there is a $16 million option looming that makes the concept of even considering Griffin an option shortsighted. Sunday’s game is, perhaps, the most statistically probable win left on this year’s schedule. But despite all the talk off the field this week, it won’t be a referendum on Cousins, and it’s not a must-win game. You can’t have a must-win game when the season is doomed before it ever starts. There has been an understanding ever since Cousins was named the starter for the full season that this was a season of lowered expectations. So we aren’t calling for Cousins to be benched any more than we were saying the team was destined to mediocrity when he was named the starter, because all he has done is go out and be Kirk Cousins.